I've always had a fascination with the sea. With her motion, her vastness, her calm and her ire. So, it is natural that I'd be drawn to those who make their living from her. Who spend their days close to her surface, setting traps, pulling nets, doing whatever it is that men and women do to pull the mysterious creatures from her that end up on our tables. While tourist bureaus boast historical treasures - plots of land where Vikings lived 1,000 years ago, homes once owned by famous sea captains or paintings produced by noteworthy artists - I give them but a passing glance and make my way towards the local ports. There I can view vessels of various sizes and shapes, painted in cheerful colors, with gear and nets, anchors and lines, baskets and pots weathered by use. Always, I'm on the lookout for the human factor, the - traditionally men - who have chosen this life I can only imagine, though, on this trip, most of the boats have been at rest. I've managed to arrive mid-season, so the fishermen are home, taking a break from the sea. It was with delight that a truck pulled up shortly after I arrived in Port de Grave and a man got out to check on his little white boat with aqua trim. Bernaird owned the "K & Sons", though he couldn't speak to who K or the sons might be. The boat was thus named when I bought her some years ago. 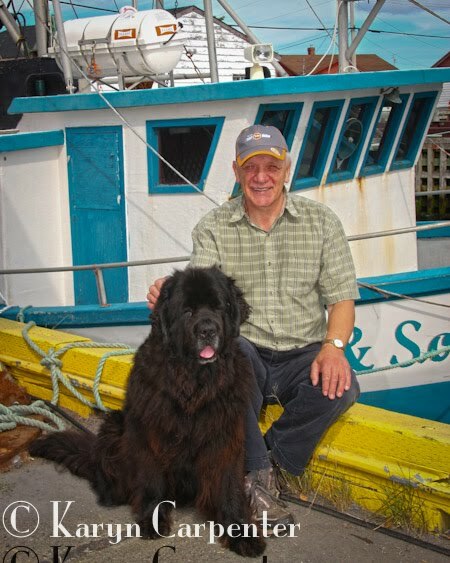 A fisherman for 50 years, Bernaird can travel some 30 miles from his home cove and is supported by a crew of 3 or 4. When asked if he had experienced any close calls on the sea, he admitted to falling over a couple times but had been very lucky. "Someone noticed something out of the corner of his eye, looked and realized I was gone. If they hadn't noticed when they did, I'd have been a goner," he said. Though his village is full of fishermen he proudly notes that they've been very lucky. "We've never known anyone from this port to die on the water." We hope the trend continues. Further down the road, we were struck by the beauty of a cove, its red fishing sheds warmed by the setting sun. It screamed "photo op", and we turned around to take advantage of the beautiful moment. There we met two brothers, Wish and Steven, who had come in on a fishing vessel from Labrador. They allowed us to take a few photos of Arayo with piles of lines as a backdrop and shared a bit of their life on the water. The older brother, Wish, has spent 3 years working as a fishing hand. 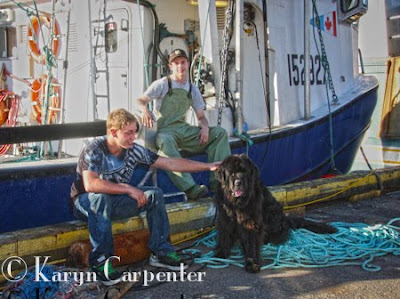 Steven, his younger brother, will finish this, his first season, then return to complete 12th grade and then study law, admitting that while fishing, can be a good way to make a living, it isn't something you can count on. That Arayo! She just can't take a bad picture! Of course, it helps lots if your people mama is a skilled photographer, LOL. Love the pictures and the stories that go with them. Tummy rubs to Arayo! Sounds like you are having an amazing time. How is the weather holding up? It looks like you are getting some sunshine. We will talk wedding when you get back.